Front: (1) Portrait of Madeeha Al Musawi. (2) Tigris River and City of Baghdad. Photography: Dominique A. Pineiro (3) Drawing of a lamassu, an ancient Assyrian protective deity. (4) Iraqi banknotes. Back: (1) Baghdad City of Peace Carnival: an annual event held on the International Day of Peace, organized by young activists since 2011. (2) Illustration of the Iraqi Freedom Monument which takes the form of a large scale cylindrical seal, and honors the resilience of the Iraqi people against dictators throughout the centuries, sculpted by Jawad Salim. 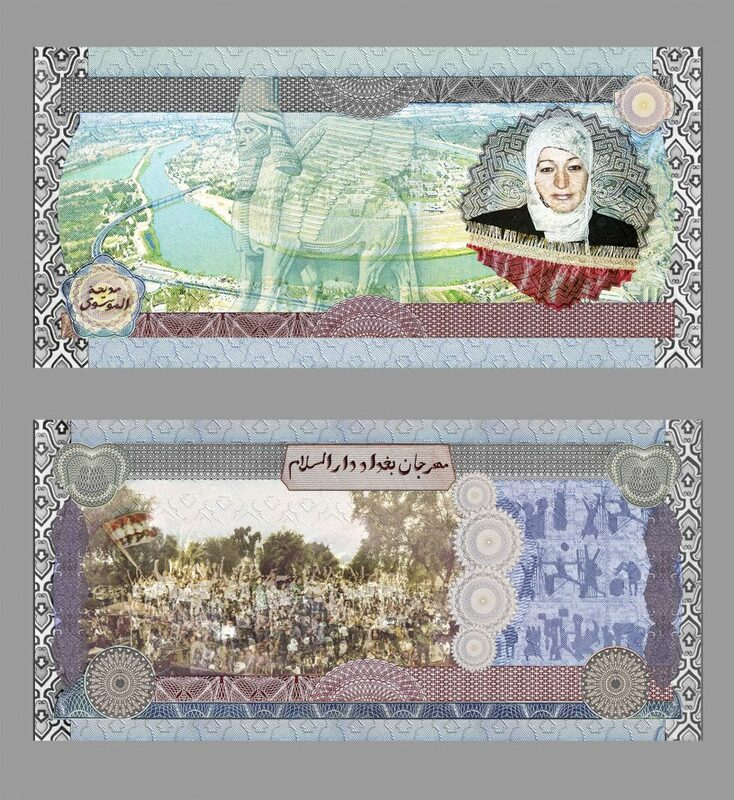 (3) Iraqi banknotes. Activist, philanthropist, entrepreneur seamstress, and Mother Teresa are some of the names Madeeha Al Musawi has been called. Madeeha is one of the most resilient citizens of Baghdad, unafraid of danger, threats, or any obstacles to her humanitarian mission to rebuild Iraq. There are more than 3 million internally displaced Iraqis who were uprooted by the war, and remain without homes or sustainable income; many are still forced to live in camps. Madeeha has housed thousands of these families in Baghdad. With the help of various nongovernmental organizations, she arranges for convoys to deliver food and supplies to the refugee camps. She won a seat and has served as a representative for the District of Karrada, where she resides. Due to circumstances that left her husband jobless in the early 1990s, Madeeha started a small tailoring business, at first with only a few sewing machines. As her business flourished, she began to hire women from displaced families. She has taught hundreds of women skills and fostered an environment where women gained confidence and become more independent. In 2008 she was listed as one of the 100 most influential people by Time magazine. Each year on the International Day of Peace the Baghdad City of Peace Carnival invites citizens to a day of live music, dance, and participatory art in the streets of Baghdad. The event provides a platform for collectives and associations to share information and engage the public on issues such as health care, social justice, and civic engagement. Supported by many generous volunteers and tireless organizers, this movement inspires young people to rebuild their country and stands as a strong symbol of peace. A group of young Baghdadis gathered through civil society initiatives and associations. We believe in the existence of peace within every person and we aspire to restore the name of Dar es Salaam to Baghdad through three basic values ​​ and principles: civic, responsibility and participation. Where we seek to provide opportunities to invest and develop the efforts and capabilities of young people to build a civil society believes in peaceful coexistence. We started our festival in 2011 in downtown Baghdad and faced new challenges and goals. Over the years, we have proved that the success of the Dar es Salaam Festival is a result of our belief in collective action and the spirit of volunteering. We work throughout the year in community service through various campaigns and initiatives to meet together on World Peace Day.